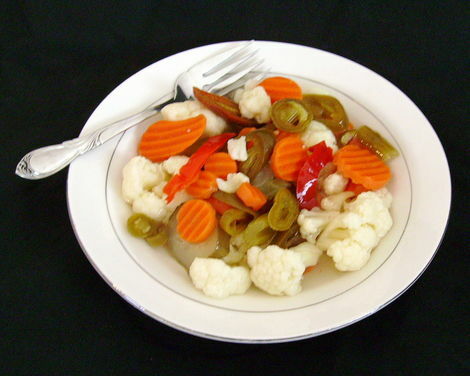 Giardiniera is a relish of mixed pickled vegetables. Traditionally, giardiniera includes cauliflower, sweet red peppers, crinkle-cut carrots, pitted green olives, gherkins and celery. The pickled vegetables are marinated in oil, red- or white-wine vinegar, herbs and spices.